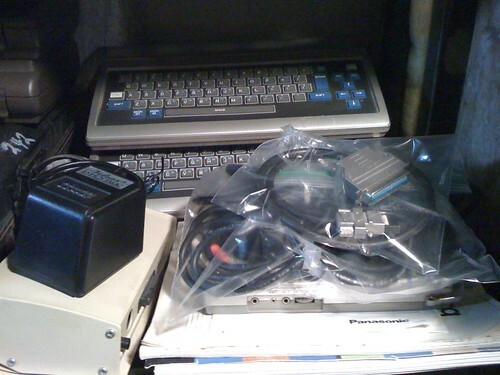 As luck would have it, I came across an amazing stash of Panasonic JR-200U (aka, Panasonic Personal Computer or PPC) stuff for about $40 shipped that puts my previous collection for this system to shame. In fact, the only major item not present in this new haul was Wordwatch. There will be no need for me to re-hash what was in the prior "A Long Visual Look at..." as you can just read it for yourself if you haven't already. Since all of the setup stuff is already taken care of, I can get right into this haul and PART 1, which will briefly lead into coverage of one of the interesting games now in my possession (subsequent parts will naturally follow suit in various degrees of detail). As you can see, this JR-200U is in similarly great condition as the first one, and came with pretty much the same connections, save for the addition of a Panasonic TV switch box, which is a nice touch for the collection. Anyway, obviously the real treasure here is in the software. 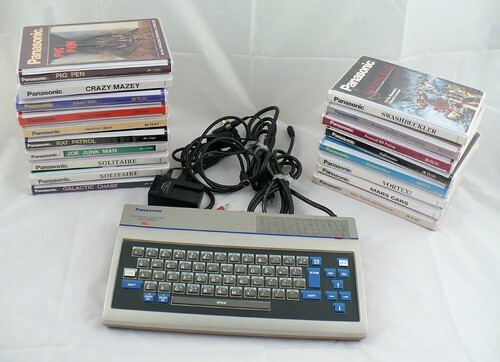 As I stated in the previous entry on this system, developer (since Panasonic appears to always be the publisher for their system) Instant Software sounded vaguely familiar, but I couldn't quite place them, and developer Datamost was definitely familiar, being heavily involved in other 8-bit computers, particularly the Apple II, and particularly for games that included Swashbuckler and Aztec. Interestingly, I have a good amount of Datamost software for the Apple II, software that came in the early Zip Loc style bags before boxes became all but competitively mandatory. What we'll see as we go along here throughout this series is that I have some of the same Datamost games for the Apple II, which will make comparisons quite easy and interesting (not to mention the fact that we can all play along at Virtual Apple 2 in our browsers). Finally, while my previous exposure to this system made me think there were only the two developers, it turns out that a third has now been introduced, tmq (TMQ) SOFTWARE, INC., or "Trademark of Quality", a developer I definitely never heard of. I'll be covering their games in future entries, but I can tell you right now that their game cover art is downright hideous. See you next time and be sure to help spread the word! Wow bill! Thats pretty sweet. I remember I had a version of Santa Paravia on the PC in CGA graphics. Published by Scott Adams iirc. I'm looking forward to seeing some of those screenshots. I doubt its the same port since a lot of companies did versions of Santa Paravia (I remember fondly playing it and cursing when my people get wiped out in drought etc). Finally, while my previous exposure to this system made me think there were only the two developers, it turns out that a third has now been introduced, tmq (TMQ) SOFTWARE, INC., or "Trademark of Quality", a developer I definitely never heard of. I'll be covering their games in future entries, but I can tell you right now that their game cover art is downright hideous. An Apple II version of this game does exist. Its some kind of "inverted Pac-Man" - meaning that your little man doesn't eat the dots but rather puts them into the maze. The Santa Paravia game from Instant Software does also exist for the Apple II (dated 1979) and is available at Asimov, too. Hmm, it's interesting that the three developers did Apple II stuff. I wonder if there's some type of connection? Just an update... I was thisclose to getting in on another JR-200U software haul, this time one with a few of the game I don't have and some Walt Disney stuff (yes, it even had real Walt Disney software). Unfortunately, it wasn't meant to be. On the plus side, I was able to get a third JR-200U unit (another working one), this one with (apparently) a reproduction manual, as well as the high speed cassette drive with proprietary cable and manual. Good stuff! I'm just dissapointed I also couldn't score the software, as that would have enabled me to create the ultimate JR-200U resource. Still lots of good stuff in my collection, though. I big thing for me was the manual, which is very, very difficult to get, as I've detailed. Added to the "Kids & the Panasonic" book (published by Datamost!) I recently picked up on a friendly suggestion, I should now have all the documentation I finally need for the system. Just an update... I was thisclose to getting in on another JR-200U software haul, this time one with a few of the game I don't have and some Walt Disney stuff (yes, it even had real Walt Disney software). Unfortunately, it wasn't meant to be. On the plus side, I was able to get a third JR-200U unit (another working one), this one with (apparently) a reproduction manual, as well as the high speed cassette drive with proprietary cable and manual. Good stuff! I'm just disappointed I also couldn't score the software, as that would have enabled me to create the ultimate JR-200U resource. Still lots of good stuff in my collection, though. It arrived. After a quick peek through the reproduction manual (it's a photocopy), it turns out that the RGB port is actually dual RGB/Composite, so that's why I was able to get a nice composite signal out of it. What it outputs is dependent upon the cable. Also, the proprietary cable that came with it is not for the cassette drive - that just uses standard connections to achieve its higher speed - it's for connecting a centronics compatible printer (though the printer mentions a specific Panasonic printer, I believe it should in theory work with standard printers that are compatible with systems from that era). So that's rather interesting. This was actually a game that I wrote for the Panasonic JR-200 in 5 weeks time, including an all nighter with Jack and Coke in a Las Vegas hotel room the night before it was supposed to be shown for the first time along with the JR-200 introduction (CES I think). Anychance you still have "Thief", and does it work? Hi, Bob, I got your email too. I assume you did the Apple II version first, then the JR-200U version? It seems like Datamost was one of the biggest JR-200U third party developers. Did you feel you were able to take advantage of the JR-200U's features? 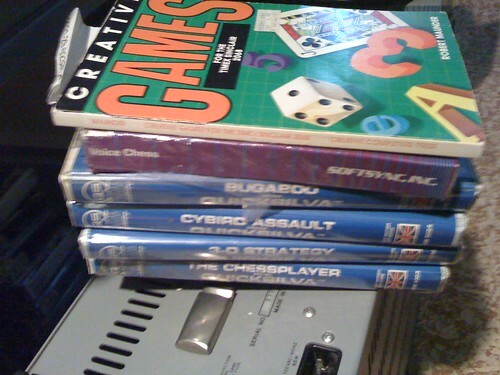 Yes, I have an extra copy of your game in the box as well as an extra working system. I also have several copies of your "Pandora's Box" for the Apple II. I don't have any "Spectre" or "Space Ark." I'm not sure what else you worked on. I think you were in this contest also if I remember right!!! program to the Panasonic via the joystick port. This was a long time ago, nice find. Hey do you have TYPE ATTACK??!! 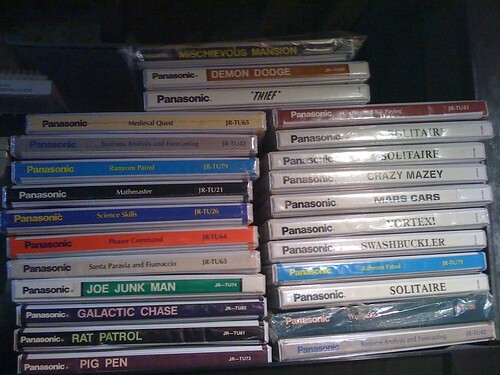 I think we did that for the panasonic as well.